A large part of our business is dedicated to sales and support of the do-it-yourself homeowner who aspires to bring stone into their home or landscape environment. We are glad to give advice on the "how-to's" of many types of projects from simple flagstone walkways and patios, drystack walls and stairways to ponds and "pond-less" water features. 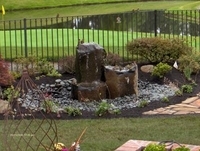 The flexibility of a pond-less feature using rubber pond liner makes this a popular method among professionals and do-it-yourselfers. 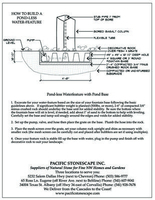 The only problem many people encounter is the difficulty of getting a large, heavy bubbler stone placed perfectly on the delicate liner without accidentally puncturing it - especially in a backyard situation where access by heavy equipment is limited. The Pond-less Bubbler Base Unit replaces the need to use rubber pond liner which - if it accidentally gets punctured - is the weak link of any feature. 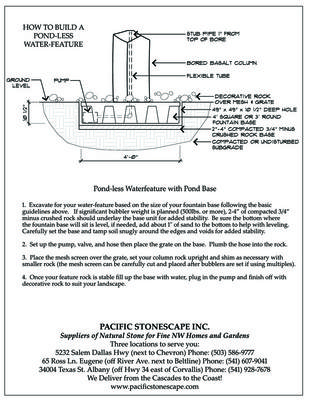 The unit serves as the base for the bubbling feature stone, water reservoir and protected place to locate the pump. They are virtually bullet-proof and very easy to maintain. Dry-setting is the most popular, most versatile and easiest method method of installing natural flagstone. But it can be more maintenance and less stable depending on the amount of traffic it receives. Download our detailed instructions for complete picture on this process. For a permanent and maintenance-free natural stone surface, mortar-setting is the way to go. Highly recommended for primary entries and high-use outdoor entertainment areas and walkways, mortar-set flagstone can be swept, blown or hosed-off without the grit or dirt than is typical of dry-set flagstone. There is little chance of the stones or grout shifting once it is set which makes for a safer, higher utility surface. How many times do you see a drystacked, small-stone wall that has fallen apart? Well, use this method next time and you will have one that will be there a long, long time. The photo in this section is of a small wall we built at our Eugene stone yard that has been run into with our forklift and hasn't even flinched when a wall of this type that was drystacked without mortar would have blown apart! Traditional, dyed-in-the-wool drystack stone masons might scoff at this method (Alan will pull what's left of his hair out when he reads this) but if you want to use smaller, easier-to-handle stone and want it to stay put and be somewhat structural - try this out UP TO 4' IN HEIGHT - above which you should consult an engineer.